I subscribe wholeheartedly to the "buy great shoes & bags and everything else will fall together" philosophy. After all, no one looks pulled together hobbling around in shoes that give them blisters. If your shoes are right, you can get away with spending less on the rest of your closet. At $90, these shoes aren't exactly budget busters. For me, they fall somewhere in the middle of what I usually spend, but they easily pull together both a "luxe" and a "less" outfit. I'm obsessed with finding the perfect pair of boyfriend jeans right now, because I love how they elevate basics and neutrals to an intentional look. These from Joe's have the look and fit I'm after, but these from ASOS have the look at $100 less. I'm envisioning them paired with a simple cotton tank. I love the softness and drape of T by Alexander Wang, but it's easy to get a similar look for the price of lunch with this version. Are you into boyfriend jeans? I am saying a silent prayer of thanks as I'm part of the "athletic thigh" club, and happy to have this trend around. Haha! I, too, am part of the athletic thigh club. I love the look of these jeans -- they remind me of a look I've seen on lots of chic Parisian women. And the inexpensive tank you chose would actually be my preference! I like all that roomy, swingy-ness. What a great, simple outfit. The shoes really make it! Cute outfit! I love being able to just throw something on, be comfortable and still look cute. The shoes do all the work! Loving those shoes, and I would definitely go with the less version! Super cute! So into boyfriend jeans, and swooning over this luxe/less post design (your make the cutest logos!). 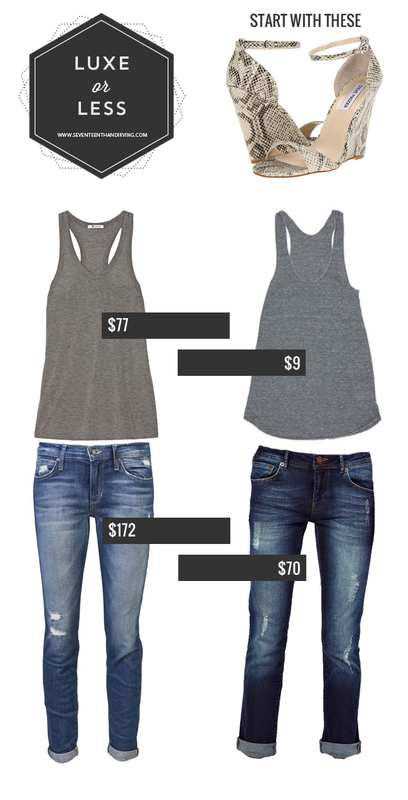 A gray tank is totally a NEED in my closet, and I might need to stock up on this cheaper alternative! I love the idea of boyfriend jeans, but I'm at a loss for how to wear them. I totally thought those shoes were going to be in the luxe category and I'd be able to resist them - now that I know the price, it's going to be much harder! Great look. Glad to pleasantly surprise you! I think they look so luxe for the price! The Parisians do elegant basics flawlessly. Most of my sartorial inspiration comes from images from Paris or Stockholm! if you want I also did a post about how to style boyfriend jeans (but wouldn't want to post without your OK!). Love how these are a more fitted boyfriend jean option, which is infinitely more flattering to 98 percent of women. These are great finds, Lauren! And, yes, I'm definitely into boyfriend jeans. I love that they're sticking around. And paired with heels, they are a great masculine/feminine combo! Yes of course! Share away!!! You know you're always welcome to do that here! these jeans look AMAZING and i've been contemplating buying them for the past week. the problem is, i ordered another pair of jeans from ASOS before and they're super long on me (i'm /almost/ 5'4") and these boyfriend jeans aren't offered in petite. how tall are you? are these too long for you? Hey Kat - sorry for the delayed reply! I haven't purchased these, so I'm not certain on length. They do show them on a 5'10" model, but the best thing about boyfriend jeans is the rolling! I usually get mine hemmed, but with those you wouldn't have to. Just noticed they're on sale, if you haven't made the jump!